I had always thought that Estate Sales were held strictly for the purpose of liquidating the estate of a deceased person. And that is often the case, but it is by no means the only one. Estate Sales are performed for any number of other reasons, including: Divorce Settlement, foreclosure or bankruptcy, sudden relocation, just plain “start from scratch on my belongings”, or dramatically downsizing. 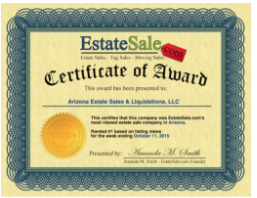 I spoke with Bonnie Frederics, owner of Arizona Estate Sales and Liquidations, about the ins and outs of estate sales. In what follows I’ve shared some of Bonnie’s insights. For starters, what is the primary aim of an estate liquidation? Well, it’s to maximize the sale proceeds to the owner or beneficiary of the estate, to get as much possible. In order to do that, the manager of the sale needs to have considerable knowledge about the resale value of second (or more)-hand items of virtually every imaginable kind. Knowledge like this comes only from extensive experience in a particular local market. In this case, we’re talking about the Tucson market with its buyers and their unique tastes and preferences and budgets. Next, the operator of the sale needs to know how to organize, stage and present the items that are being offered for sale. Sometimes a little description about the operating system of a computer, for example, or the backstory on an old collectible item, can make the difference between getting dollars for something rather than pennies. Marketing your sale and the items you’re selling is a cumbersome but essential task, and a newspaper ad is just the beginning. In many cases, hundreds of photographs of the final, staged products need to be taken and shared via email, social media and the internet. You need to be able to reach a big audience of potential customers on short notice. Perhaps most importantly, the Estate Sale company you use needs to have skin in the game and be rewarded in proportion to the success of the sale. You should never pay a company a retainer or deposit until labor has actually begun. They are sharing in both your risk and reward. One final tip. If you’re considering having an estate sale, don’t throw away anything until Bonnie has looked it all over. You’d be amazed by what people will buy! Then again, you have it because either you wanted it or someone close to you did.